The Canadian Opera Company’s new production of Tristan und Isolde, its first in 25 years, is a feast of glorious music making. It may seem hard to believe but the singing of the cast and the playing of the COC Orchestra are so outstanding that even after 5½ hours the end arrived too soon. As for the production by famed director Peter Sellars, it was a staging that did little to enhance one’s enjoyment of the story or the music but fortunately also did little to undermine it. Sellars’ current production is a re-creation of the one he created for the Paris Opera in 2005. Its primary feature is a film by acclaimed video artist Bill Viola that runs as a backdrop for the entire length of the opera. The impetus behind this staging came from conductor Esa-Pekka Salonen, who wanted a visual component for “the Tristan Project”, a series of concerts based on each of the three acts of the opera along with later works inspired by it. The concert project became an opera production when Salonen conducted the work in Paris. His notion was to fulfill Wagner’s ideal of opera as a Gesamtkunstwerk (“total work of art”), all the arts combined into one. In practice, Wagner ignored dance as a component and his view of the visual arts, as contemporary drawings show, was rather literal-minded. In the Ring cycle Rhinemaidens were pushed about on elevated perches behind painted waves and the huge dragon Fafner had to be operated by several people. Theoretically, then, Viola’s film should provide the active visual component that would suit a Gesamtkunstwerk of the present day. We have seen how theatre artists like Robert Lepage have successfully integrated film or video into stage productions. Here, Viola’s work contributes almost nothing. Viola has an elaborate explanation of what he is doing in the programme – how he is combining “the Hindu and Buddhist traditions of Tantra that lie submerged in the Western cultural unconscious” – but that’s not the effect it has. Mostly it seems simply to present background scenery. When characters sing of the sea, we see it. When the lovers sing of the flames of passion, he shows us a bonfire. When Isolde sings of the goddess of love, we see the moon. On this level Viola’s film is innocuous and even banal. At two points, however, his film is actively distracting and both involve his use of actors who are meant to represent the titular couple. When Isolde begins her long narrative in Act 1 explaining how she came to fall in love with Tristan, Viola stages an extended scene of ritual purification of his filmic couple. 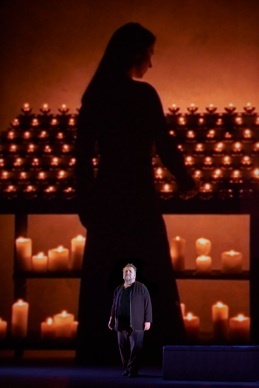 Not only is it disconcerting to see the actors on screen dwarf the singers on stage but the ceremony has absolutely nothing to do with Isolde’s narrative. She is angry that Tristan does not acknowledge she loves him and that he is in love with her and is furious that he is taking her to marry the Cornish King Marke as a trophy of war. This anger is hardly the submissive purification Viola portrays. The second instance occurs, unfortunately, during the famous “Liebestod” that ends the opera. Viola envisions the slain Tristan lying on a bier at the bottom of the sea. During the “Liebestod” Tristan’s body somehow effervesces to the surface in an increasing rush of bubbles. Besides looking rather like a denture commercial, the image makes no sense since Isolde is singing about drowning and sinking (“ertrinken, versinken”) and not about rising upwards out of the water as in Viola’s images. While Viola’s film dominates the otherwise all-black stage, with some concentration, you can ignore it and turn it into just a flickering light in the background. In fact, the performances of the singers are so riveting you will find yourself naturally drawn to their faces and not to the film. Sellars’ direction has two more unusual characteristics. One is his non-naturalistic direction of the singers. He gives them a very restrict set of gestures and poses and has them make sudden transitions from one pose to the next. He suggests that they are confined on stage by the separate boxes of light created by lighting designer James F. Ingalls that surround them. For a character to move from his or her box of light to another or to the single raised platform gives that movement added significance. More often than not Sellars directs the singers to sing facing the audience and not each other, sometimes even describing things that lie behind them rather than in front of them. Since his approach to the opera emphasizes its symbolism, we soon adapt to this stylization, although it is a relief when he finally allows the two ardent lovers at least to hold hands in Act 2. Sellars’ most successful strategy is his most purely theatrical one of involving the entire auditorium in the action. His staging of the arrival of Tristan’s ship in Cornwall is fantastic. As the house lights rise spotlights cast all about the interior of the hall finally picking out the chorus and trumpets perched on the verge of the Fifth Ring with King Marke and Melot walking down the house right aisle toward the stage to greet the stage-as-ship. The audience thus becomes the people of Cornwall gathered to greet their new queen. Earlier Sellars had placed Owen McCausland as a clear-voiced Young Sailor high in the Fifth Ring on house right as if he were in the ship’s crows-nest. In Act 2 during the hunting sequence, Sellars places the horns in the boxes on opposite sides of the Second Ring to place us in the middle of the action. Here Sellars’ impulse towards the theatrical actually causes us to turn our heads away from the stage and the film. We can only wish that this theatricality were the main component of the production. For Torontonians, the primary virtue of this production is to see our own Ben Heppner on stage in a role for which he has won acclaim throughout the world. He is in fine form, his voice enormous, ringing and heroic. The scene in Act 3, when Tristan yearns so much to see Isolde again before he dies that he falls into a delusion that she has arrived, is heart-breaking. It is simply marvellous to see him at home on stage singing with such security and passion. German soprano Melanie Diener is an ideal Isolde. She has a full, rich, liquid tone without a trace of the harshness that often mars the voices of some Wagnerian sopranos and commands enormous power. She is directed to sing the “Liebestod” not as if she were willing herself to die but rather as an incantation. Within that stricture her Isolde transforms herself from grieving lover to the high priestess of his obsequies raising her arms in command of higher powers at the end rather than appearing to die. As King Marke, German bass Franz-Josef Selig turns out to be the most sympathetic of all the characters. He has a gorgeous, velvety voice full of colour and richness. Sellars has decided that King Marke is himself in love with Tristan, and indeed his words, to a modern mind, can be construed that way. His narrative in Act 2 explaining his sorrow at Tristan’s betrayal of his love for him is the most moving and human moment in the opera since it expresses love on a completely personal level rather than on the exalted, absolutist scale of Tristan and Isolde. Daveda Karanas successfully conveys Brangäne’s concern for her mistress’s life, to the point of disobeying her orders, but Karanas’ voice with its strong vibrato often takes on an unpleasant metallic tone. American bass-baritone Alan Held makes a highly sympathetic Kurwenal, his skillful acting and resonant voice capturing the deep loyalty he feels for his master Tristan. American bass-baritone Ryan McKinny has little to sing as the villainous Melot but in that space portrays a man whose actions are more foolish than evil since he clearly does not understand the depth of Marke’s feelings for Tristan, whom he betrays. Heppner, Diener and Selig all received massive rounds of applause and volleys of bravos, but the audience justifiably reserved the greatest amount of acclaim for Johannes Debus, who was conducting his first Tristan, and the COC Orchestra. Debus began the overture rather cautiously as one might expect, but as soon as the opera proper began he propelled the orchestra into playing of extraordinary unanimity and depth. Some critics have said that all 20th-century music derives from Tristan, and what was most notable was how Debus related Wagner’s music forward to the future, revelling in Wagner’s use of dissonance, chromaticism and harmonic suspension. He and the orchestra played the opera as it is, a work composed far ahead of its time, and the result was an amazing freshness and vitality that swept us up in the action – an unforgettable triumph for Debus and the orchestra. For this reason alone, this Tristan is definitely worth seeing. Tune out Viola’s images by all means, but opens your ears to the magnificent music-making of the cast and orchestra and you will be overwhelmed by the opera’s power. Note: Michael Baba and Margaret Jane Wray sing the title roles on February 8 and 23. A version of this review will appear later this year in Opera News. Photo: (top) Daveda Karanas Melanie Diener, Ben Heppner and Franz-Josef Selig with Jeff Mills on film; (middle) Ben Heppner with Lisa Rhoden on film. ©2013 Michael Cooper.